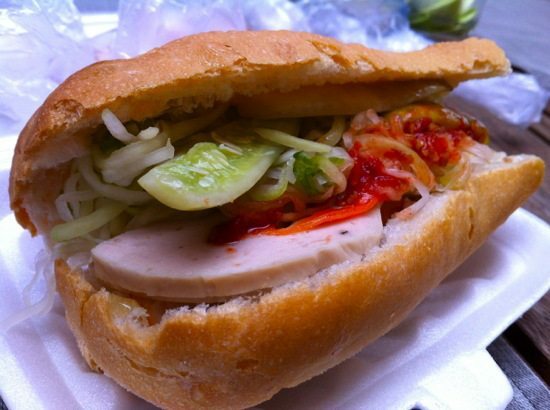 One of the French legacies in Cambodia, Nom Pang (Cambodian Baguette). Today when I started my usual Google search, I saw this below image on Google search front page reminding us today(13th September 2015) is the 22nd Anniversary of the official recognition of French traditional bread, Baguettes. This is called "Baguette", which is a long thin loaf of French bread that is commonly made from basic lean dough. It is distinguishable by its length and crisp crust. The baguette today is often considered one of the symbols of French culture viewed from abroad. Have you ever noticed that Baguettes can also be found in Cambodia? The ones that we always call "Nom Pang", or "Cambodian Baguette". Moreover, it's recognized as "Nom Pang Bayon (នំបុ័ងបាយ័ន)" which is called by the Phnom Penh citizens, why? because, in Phnom Penh city, especially in the early morning, we would hear the word "នំបុ័ងបាយ័ន! នំបុ័ងបាក់យ៉ុង!" calling from the mobile stalls moving along the street selling those freshly made baguettes from a famous bakery store called "Bayon Bakery (ហាងនំបុ័ងបាយ័ន)". Image source: Footprints & memories. 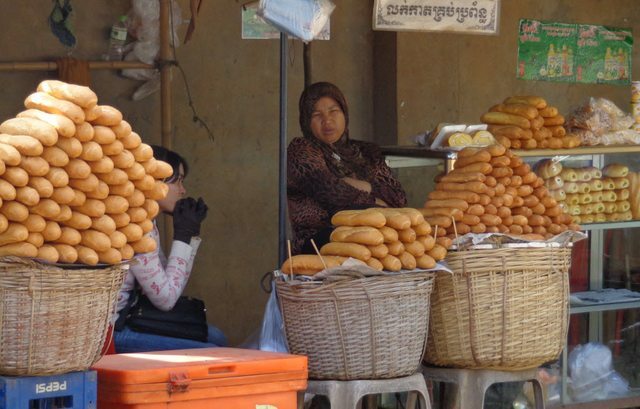 Due to the fact that Cambodia was a French Protectorate from 1867 until 1949, it somehow has absorbed the French legacy as simple as having baguette stalls everywhere. I have to admit that while I was in high school, I thought that baguettes can be found everywhere in the world, it's a classic kind of breads, until I first went to study in China. Once I noticed that baguettes are rare there, they are sold only in a few bakery shops, then I soon realized that Cambodian Baguette which is stuffed with grilled meat and topped with pickled carrots and radish salad is one of the special dishes in Cambodia. Image source: Don't think just eat. Thinking about it makes me drool!